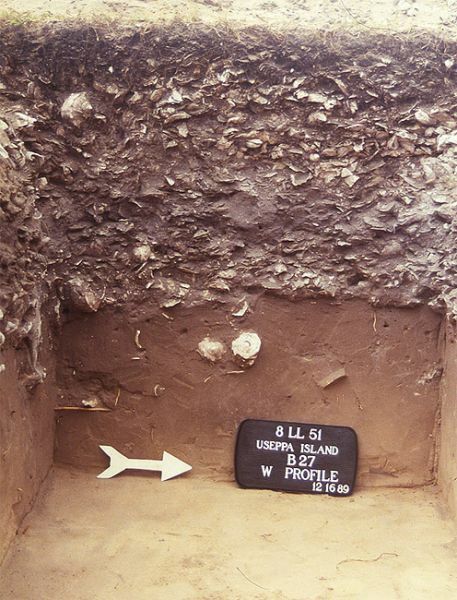 Our field work has included archaeological investigations at Josslyn Island, Buck Key, Galt Island, Cash Mound, Horr’s Island, Useppa Island, Mound Key, and the Pineland Site Complex on Pine Island. We have also done geological coring near archaeological sites to gather baseline environmental data, created archaeobotanical and zooarchaeological comparative collections, and collected marine specimens in order to study paleoclimate and paleoseasonality. The results of these studies have been reported in books, monographs, articles, videos, theses, and dissertations, and incorporated into the Calusa Heritage Trail at Pineland and the Hall of South Florida People and Environments at our exhibit facility in Gainesville. Several hundred public programs have been given. 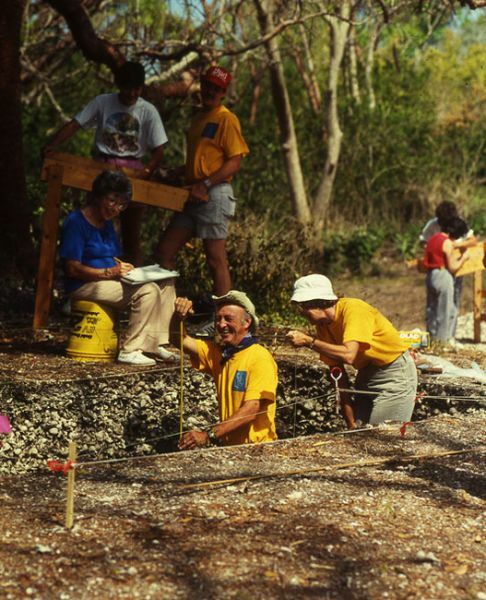 Archaeological field work at excavation I-2 at Pineland, April 1990. 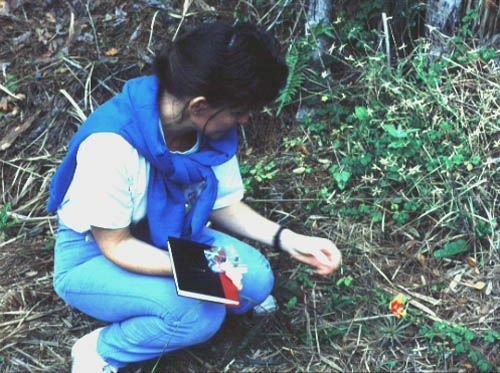 Lee Newsom collects specimens of plants at Pineland, 1991. 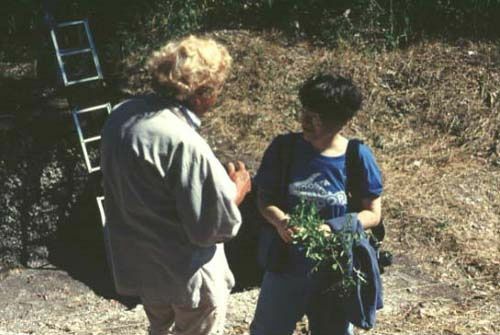 Long-time volunteer Shirley House discusses plants with archaeobotanist Margaret Scarry, Pineland, 1990. Bud House takes depth measurement, Galt Island, October 1987. 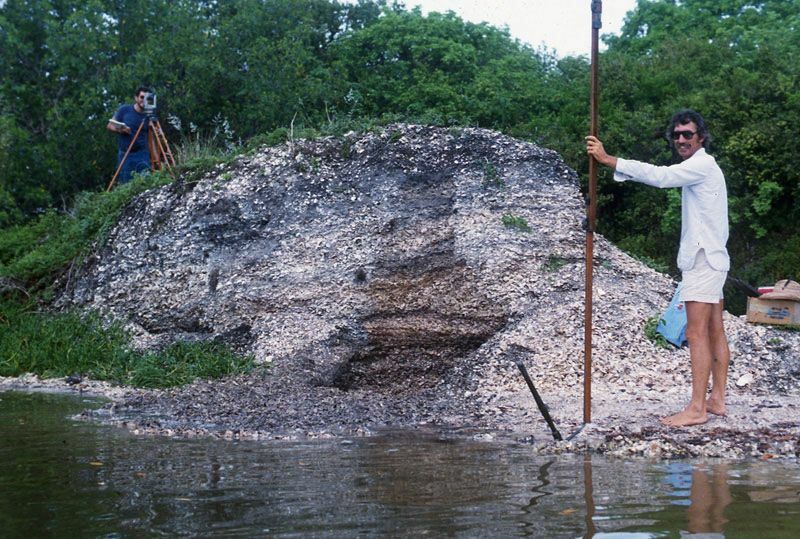 Don Cyzewski helps map eroding midden at Cash Mound, November 1986. 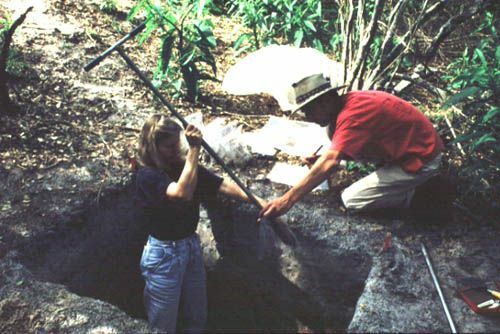 Barbara Dobbs in excavation unit I-1, Pineland, April 1990. 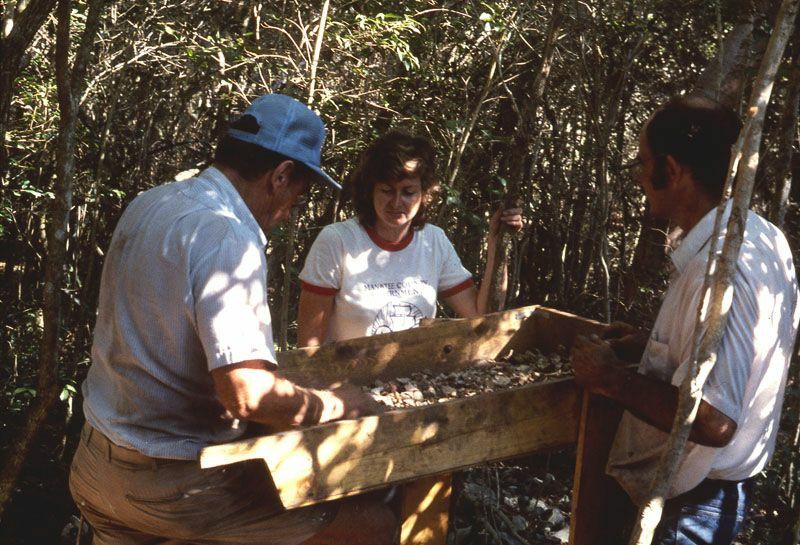 Bill Kemper, Kathy Ball, and Gary Grochowski screen for artifacts at Galt Island, October 1987. 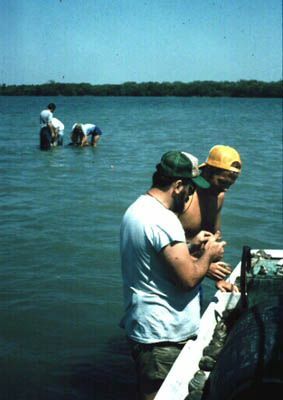 Irv Quitmyer and Doug Jones record data on clams, while Bill Marquardt, Steve Hale, Liz Wing, and Ann Cordell collect faunal samples along a transect, 1986. 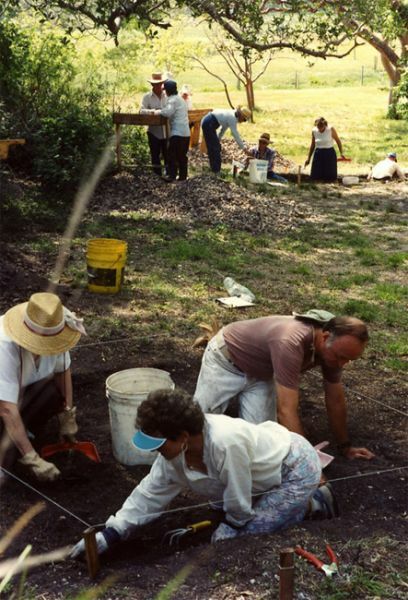 Volunteers at work, Pineland, October 1989. 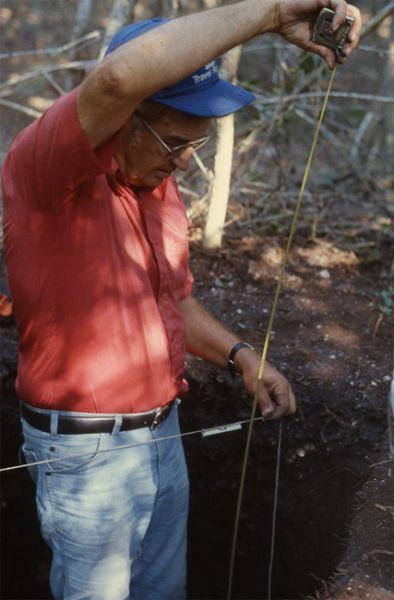 George Clark holds stadia rod for measurement, excavation C-5, Pineland 1990. 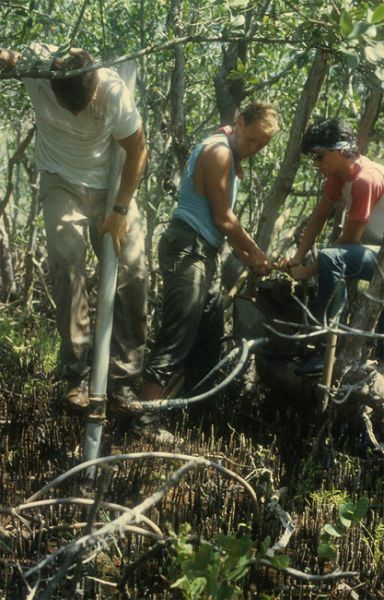 Vibracoring in the mangroves, July 1986. 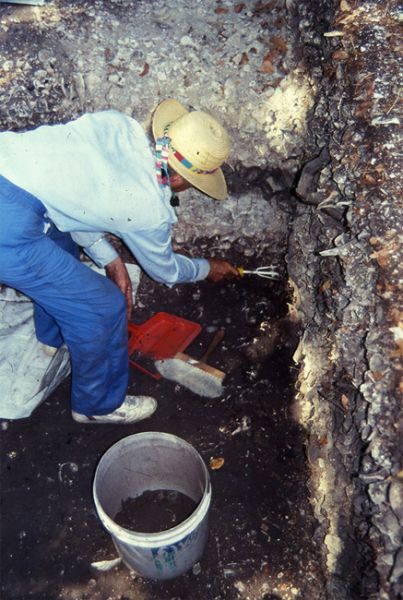 Section of 1989 excavation at Useppa Island shows deposits dating to the Late Archaic period. 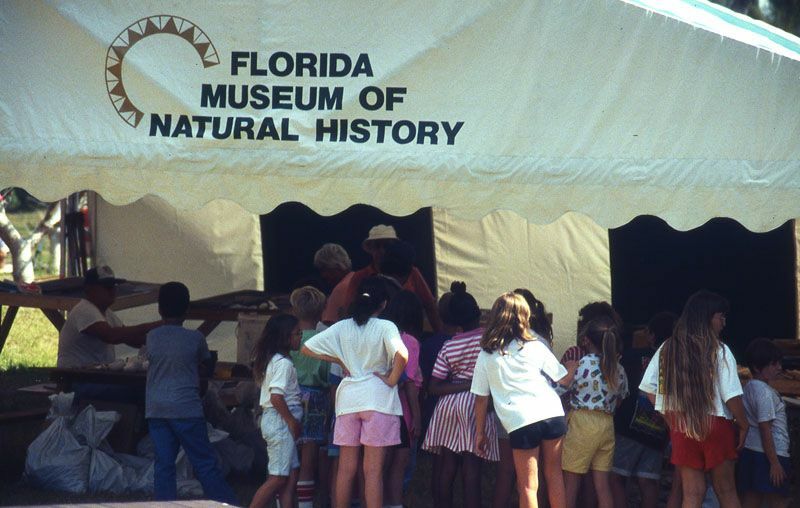 School children visit the Florida Museum tent to see archaeological lab work, Pineland, March 1990. 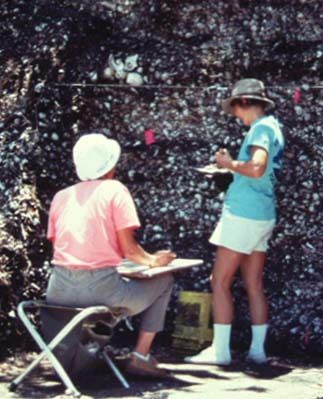 Volunteers Barbara Toomey and Linda Ballou record the strata at the Randell Mound, 1990. 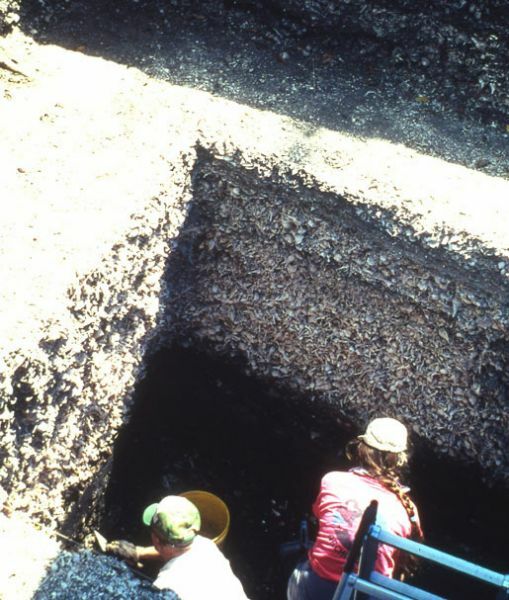 Assisted by Scott Mitchell, Sylvia Scudder takes a soil sample from the Smith Mound, Pineland Site Complex, 1992. 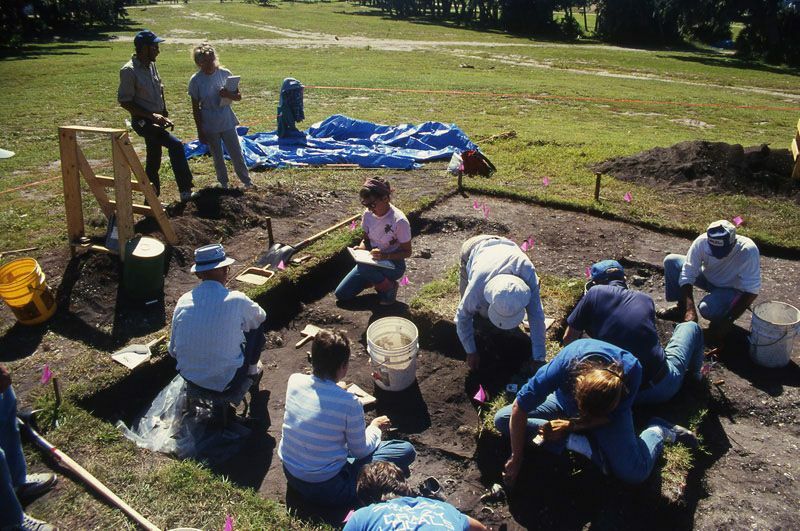 Excavations in unit C-5, Pineland, May 1990. 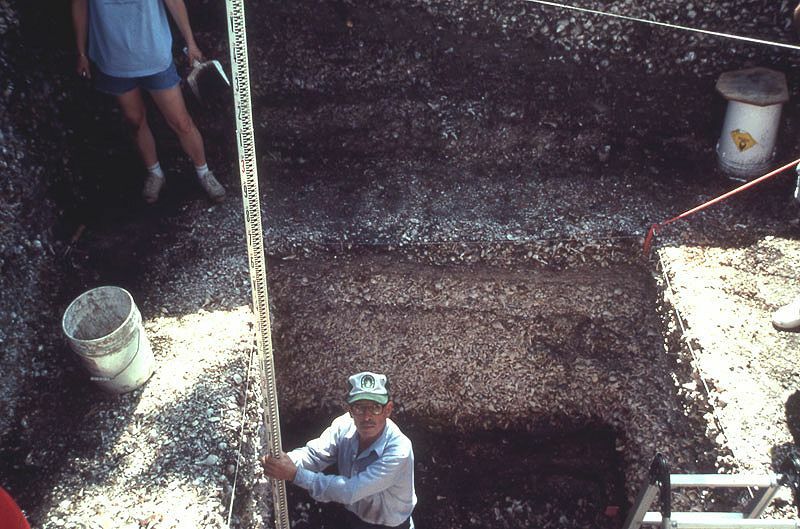 Excavations at Operation B, Useppa Island, November 1989. 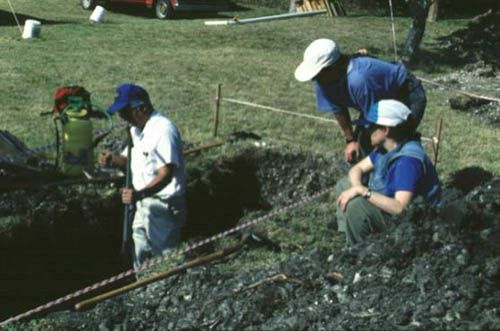 From left to right, Howard Yamataki takes a soil sample from the base of Trench 9c at the Pineland site as Karen Walker and Maxine Levin look on, 1992.